At Guru, we have seven core values around which we orient our company culture. These values are not simply suggestions, but principles we live by. We hire people who embody them and incorporate them into all aspects of Guru’s culture, including weekly meetings, monthly town halls, and yearly performance reviews. While we demonstrate these values in action year-round, we wanted to take an opportunity this Thanksgiving to reflect on one value in particular and the obligation we, and every company, have to contribute to and learn from our local communities. What's wrong with "giving back?" To us, the phrase “giving back” implies that you first took something in order to give it back. We don’t think you need to achieve some higher standing before you can be helpful; it’s important to be helpful along the way. Giving is part of the journey, not something to turn your attention to after arriving at your destination. Anyone can give first, whether they have more resources or not, and it’s this mentality that keeps the spirit of giving top of mind at Guru all year long. 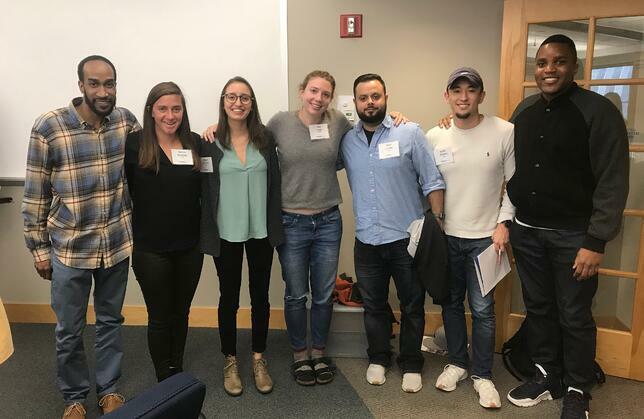 "Give first" tends to manifest mostly in philanthropic efforts like volunteering, but we like to think of it as more of an all-encompassing mindset: it’s helping out a friend, acting as a mentor, engaging with a stranger, and so on. It’s the idea that however you’re giving or helping, you’re doing it truly with no expectation of anything in return. We believe that every organization has not just a responsibility, but an obligation to contribute to its community in a meaningful way. It’s not about being charitable to check a box, it’s simply how you do your part as a local business. It can take many forms: opening your office to local communities and events, organizing service days, or even something as simple as choosing local small businesses for lunch or coffee. Companies and industries have such power to make meaningful differences in their communities, and even the smallest initiatives can have a lasting impact. We believe that every organization has not just a responsibility, but an obligation to contribute to its community in a meaningful way. The tech scene in Guru’s hometown of Philly is very community-oriented, and we feel lucky to be part of such a giving group. This fall, Philly Music Fest teamed up with REC Philly to produce TECH TOUR, which transformed tech and startup offices in the city into intimate venues for live music and panel discussions. It was an awesome fusion of music, tech, and innovation, and several local organizations jumped at the chance to open their offices to the event. Welcoming attendees interested in learning more about tech into our offices benefits the whole community and creates opportunities for all of us to learn and connect with one another. In fact, Greg Dubin, the co-founder of Local Stove (a Philly-based catering service that Guru uses to connect with local chefs for monthly catered lunches) attributes the success of his bootstrapped company to the Philly tech community. 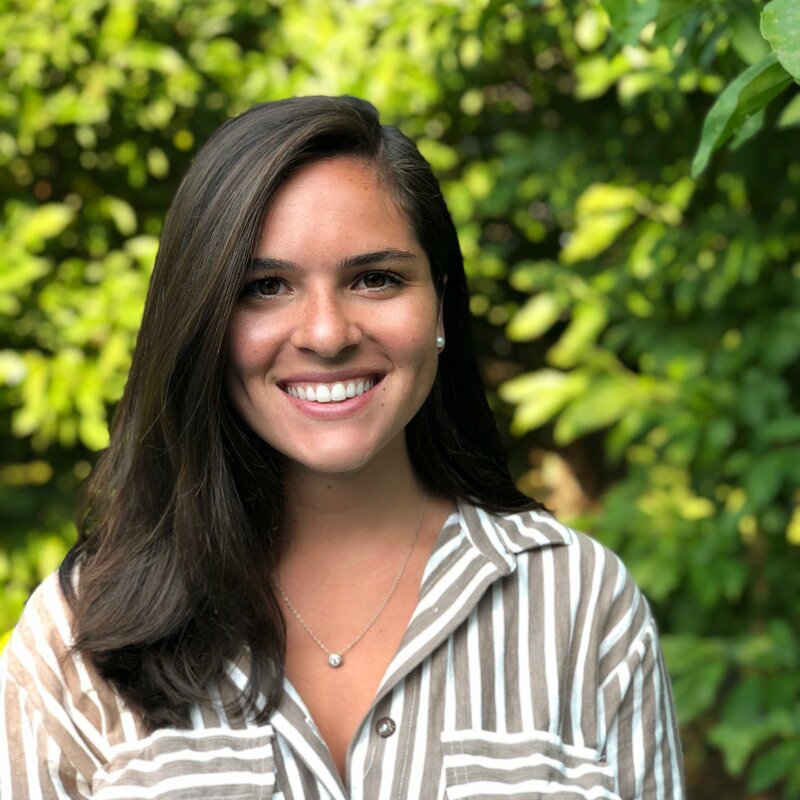 "The tech community here tries to support each other wherever it can, and it truly does feel like there's a rising tide that raises all boats." The simple fact of Philly companies using a local catering service that employs neighborhood chefs had a big impact on Local Stove itself, and on all the talented chefs it works with. It’s a very cool thing to belong to a community so focused on giving first and enriching the lives of others. Because “give first” is a core value of ours, we’ve consciously created a culture at Guru that empowers employees to embody this value in a way that’s conducive to their work-life balance. 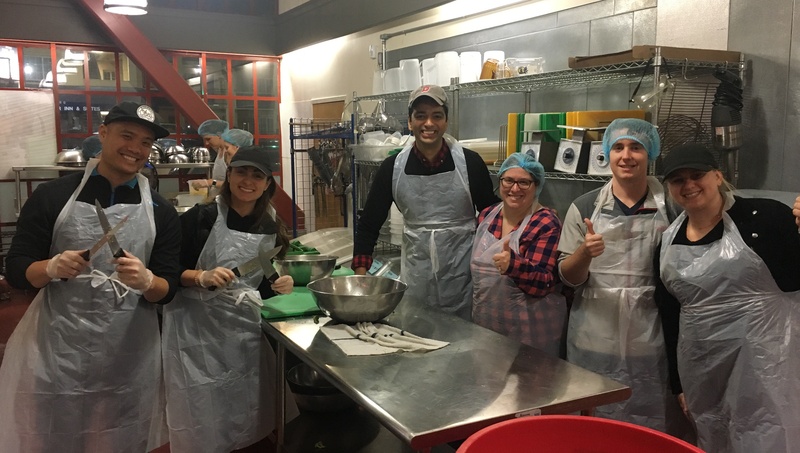 Part of it being a core value and a company priority is that if someone can’t give after work, they’re encouraged to spend part of their work day volunteering instead. We empower employees to give first whenever and however they can. Because giving first is a part of our journey, we’re always looking for ways to give and learn as we grow. Beyond our always-on “give first” mindset, we also contribute to our community in philanthropic ways. These initiatives fall into two buckets: shorter-term and longer-term. The shorter-term bucket is pioneered by individual employees. It involves volunteer opportunities that we can plug into to fill an immediate need. We have a Slack channel called #givefirst where employees post about causes they care about and call on others to get involved. 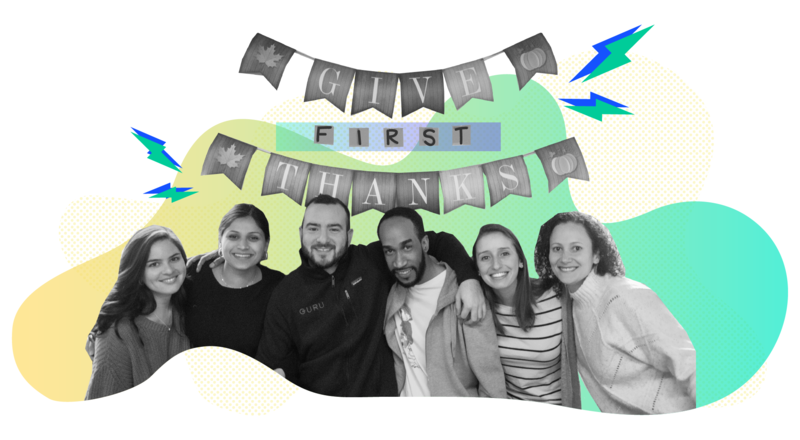 Whether that be cooking Thanksgiving meals, rehabbing a local playground, or simply wondering how we can help those affected by the wildfires in California, the #givefirst channel is a place anyone can go whenever they want to get involved. The longer-term bucket includes initiatives that Guru is officially affiliated with and that we are invested in for the long haul. Our product mission at Guru is to empower people to share knowledge and expertise, so we extend that mindset to foster education initiatives both in Philadelphia and in San Francisco, where our second office is located. If Guru can help a student by contributing to their education, and they learn about a field like tech which could literally change the course of their life, it has a compounding benefit. It's truly transformative, the role that companies like us can play in empowering young learners who may have minimal exposure to tech. Investing in the education of kids has such a long-term value potential for the community in Philadelphia in particular, but also in San Francisco and across the country. On such long-term, educational program we work closely with is Coded by Kids. Coded by Kids is a Philadelphia-based group focused on developing the next generation of tech leaders. Their mission is to give all children equal access to the resources and support they need to become future leaders in tech. We believe in Coded by Kids’ mission because they are bringing tech curriculums into the public school systems of Philadelphia by raising money, building a program, staffing it, and bringing it into the schools themselves. The organization does all the legwork for these schools rather than waiting for the school systems to sort through any constraining budgetary issues. We have all been lucky enough in our careers to receive valuable advice and mentorship and are eager to share whatever knowledge we can with the next generation. We get involved by participating in mock interviews with students, staffing STEM fairs, and teaching HTML workshops and hosting meetups at our headquarters. The spirit of giving first imparts both Guru employees and our partner organizations with new insights and valuable experiences. The core principle of “give first” is making giving a part of our journey at Guru. As we think about how to best give first at Guru, we share examples of companies we look up to and their best practices. We talk about ways to donate parts of our paychecks to our favorite charities and how to track giving initiatives through PTO. We have open discussions and we collaborate to empower each other to live our core values in action. As an organization, we have a lot to learn as we continue to grow, but we look forward to our giving capabilities growing with us. We don’t have a perfect system; we’re constantly learning about how we can best service our communities. All any company can do is make giving a priority and be on the lookout for ways to evolve their giving strategy. We can all help each other “give first” better. You can help us too! Tell us how you “give first” by tweeting @Guru_HQ using the hashtag #givefirst. Happy Thanksgiving from your friends at Guru!